The CNR train tracks bisect the park close to the lake. Visitors should note it is illegal to cross tracks unless it is at a designated track crossing. Protecting a small area of geological significance on the north shore of Kamloops Lake, the interesting feature giving the park its name can be seen both on site and from viewpoints across Kamloops Lake. The distinctive multi-coloured rocks and soils on an intrusion of batholithic rocks provide a muted rainbow of colour. Located 34 km west of Kamloops; there is no road access to the park. Land-based access to this park is not possible due to the surrounding private property. The park can be accessed by watercraft from Kamloops Lake. History: Established on April 30, 1996 as a result of recommendations made in the Kamloops Land and Resources Management Plan. 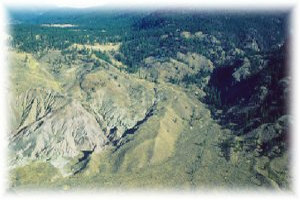 Cultural Heritage: Native copper diggings and historic mine sites are found here. The Hudson Bay Brigade Trail crossed the northeast corner, en route Carabine Creek. Conservation: Protects a small area of geological significance with related soils and vegetation on the shore of Kamloops Lake. Fluvial fans cross the area, with low elevation big sage and bluebunch wheatgrass in excellent condition. Wildlife: The area is noted for concentrations of California bighorn sheep. The approved Painted Bluffs Provincial Park Management Direction Statement [PDF] is now available online in pdf format. There are canoeing and kayaking opportunities on the lake but launching would have to take place from Savona. Fishing opportunities area available from the foreshore of this park on Kamloops Lake. Fishing is for rainbow trout. Anyone fishing or angling in British Columbia must have an appropriate licence. Backcountry areas are rarely suited for dogs due to wildlife issues and the potential for problems with bears. Pets/domestic animals must be on a leash at all times. You are responsible for the behaviour of pets and domestic animals and must dispose of their excrement. Backcountry areas are not suitable for dogs or other pets due to wildlife issues and the potential for problems with bears. There are waterskiing opportunities on Kamloops Lake.